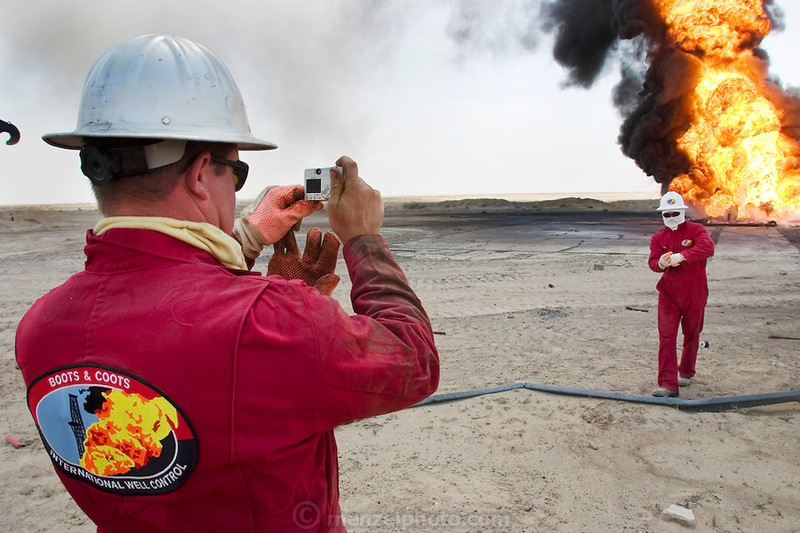 Boots and Coots firefighters photograph each other near a raging oil well fire in Rumaila field, Southern Iraq. The Rumaila field is one of Iraq's biggest with five billion barrels in reserve. Boots and Coots had a team of firefighters in Kuwait ready to go into Iraq several weeks before the war began. All of their equipment (including bulldozers and trucks) was flown in from Texas on large Russian cargo planes (AN-124s). Many of the wells are 10,000 feet deep and produce huge volumes of oil and gas under tremendous pressure, which makes capping them very difficult and dangerous. Rumaila is also spelled Rumeilah.